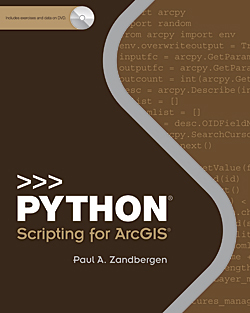 While there are numerous introductory GIS books that cover spatial analysis and a treasure trove of general resources for learning the Python language, Python Scripting for ArcGIS by Paul A. Zandbergen fills the need for a book that specifically explains how to use Python with ArcGIS 10.1. Python Scripting for ArcGIS was written for GIS professionals and upper-division undergraduate or graduate students proficient with ArcGIS for Desktop and basic GIS concepts who want to automate processes and extend ArcGIS 10.1 capabilities using Python scripting. While previous experience with programming or scripting languages, such as Visual Basic or Perl, is useful, no previous programming experience is assumed. Python was introduced at ArcGIS 9.0 and has been embraced by Esri and the ArcGIS community as the scripting language of choice for geoprocessing. It is a free, cross-platform, open-source programming language that is both powerful and widely used. Although Python has many applications, this book focuses exclusively on its use with ArcGIS 10.1. The book is divided into four parts. Part 1 introduces geoprocessing and the fundamentals of the Python language. Part 2 is the meat of the book. It teaches how to write scripts that work with spatial data. Part 3 covers more specialized tasks such as map scripting, debugging, and error handling. Part 4 shows how a script can be converted to a tool so it can be shared. Each exercise builds on the previous one, so they should be worked in order. By the end of the 14 chapters in Python Scripting for ArcGIS, the reader should be able to create custom tools that automate tasks in ArcGIS for Desktop. In addition to saving many hours, the author hopes that "the book will contribute to demystifying what 'writing code' really is for those who may be a little intimidated by it." Each chapter in the book has a corresponding exercise and its data on the accompanying DVD. ArcGIS 10.1 for Desktop is required to work the exercises. If it is not already installed, a free 180-day trial of ArcGIS 10.1 for Desktop can be downloaded.